At this week's physio session for Sue, it was decided that due to Holly's progress no further intense sessions were required. Holly in her special high chair. This was wonderful news, as not only does it mean Holly's progress is going well, we also get to reclaim some holiday time and have a break together! Whether this means we try and steal some of the fading embers of the summer and go away or book a couple of weeks at Christmas, we've now been given a get out of jail free card. The only caveat we were given was to take Holly's walker contraption wherever we go, so we can keep up with her walking therapy. This thing is a massive thing and could potentially limit any holidays to staycations, but that's not really a problem. This also means we don't have to wait and see about the Bobarth Centre therapy sessions in North London. In case you were wondering, Holly IS making wonderful progress. She hates lying down and if you pick her up to sit up, she will throw a strop if you don't pick her up to let her walk around. She's still really weak in her trunk but the dedication and strong-mindedness is there to want to do it. 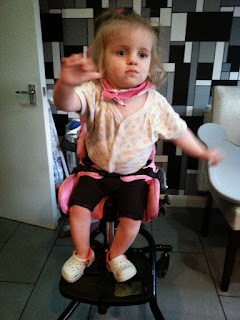 More home therapy around trunk strengthening is really needed and hopefully she will eventually walk unaided. We've been told she may never be able to do a trek, but instead may either need a cane or walking stick or only be able to walk small distances before needing to sit down again. I'm hoping small distances equates to around 4-5 miles, because I'm there with her on that. Somehow, I assume it's much shorter than that.